Think for a minute about the number of emails your organization sends out each day. Every employee emails customers, partners and stakeholders all day long. If these emails use eye catching, cool email signatures, you could promote your business and generate customer engagement without any additional marketing effort. 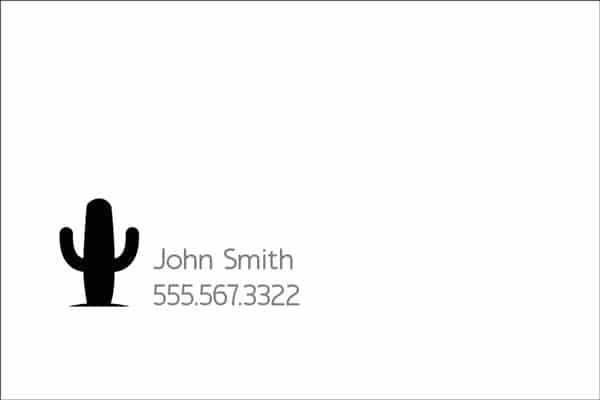 The best email signatures are designed specifically to represent you and your company. Be aware that going over the top can cause them to be seen as spam. It’s all about the balance! After nearly 7 years of experience of working with customers and prospects to get more from their signatures, we’ve put together 20 cool email signature examples, each one featuring a different idea. Get inspired, and think about how you can transform every email you send into something awesome! Before we list our 20 cool email signature examples, one of the most asked questions we get is how to create an HTML signature on your iPhone. If you are looking for instructions – go ahead and take a look. 1. Have fun with your email signature! Your brand includes everything from the logo, font, icons and colors. Sticking to guidelines builds trust with clients. However, it doesn’t mean your email signature has to be boring – it could really help bring your company or team to life. We love this fun example that uses a smart image to create depth. It looks like they’ve stuck a polaroid picture into the email. It’s also overflowing with personality – a Lego engineer will bring a smile to everyone’s face! In addition, with the personality oozing from the email, it means it’s much more likely that Jamie’s customers will give him some feedback using the buttons in his signature. 2. Color pops in this creative email signature! Using color ensures you get noticed. It’s also fun way to spruce up an otherwise black-and-white email. In addition, your clients are more likely to remember your brand if it’s attractive and colorful. Some of the best email signature ideas we’ve seen use a bright pop of color to bring character to what they do. We love the way this signature features social media icons made up of art supplies. They seem to sit in 3D on the email and the social media icons are clickable to take readers off onto their various social sites. Not only are they fun and engaging but they reflect what the company does (design). This is one of the best email signatures we’ve seen, and is also a really creative way to add social media links in an ingenious way. Got an avatar, caricature or drawing of yourself or your team? Why not use it to create your best signature for email by adding a dash of personality. It’s really simple to create, or buy for just a few dollars, a pre-prepped 3D image like the one below. This adds depth and interest to your signature too. 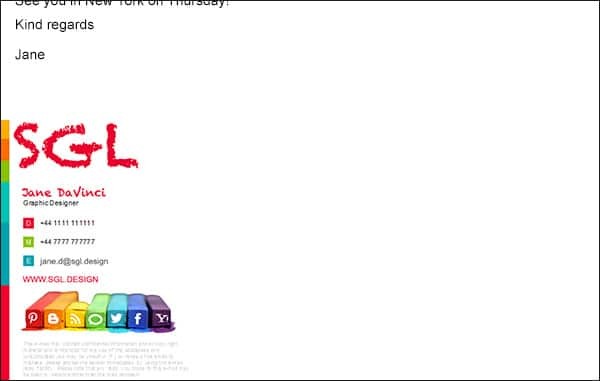 Whilst it’s just an image with a drop shadow, this awesome email signature appears to be floating on the page. Email signatures are a natural place to ask for customer feedback, especially for customer-facing teams. 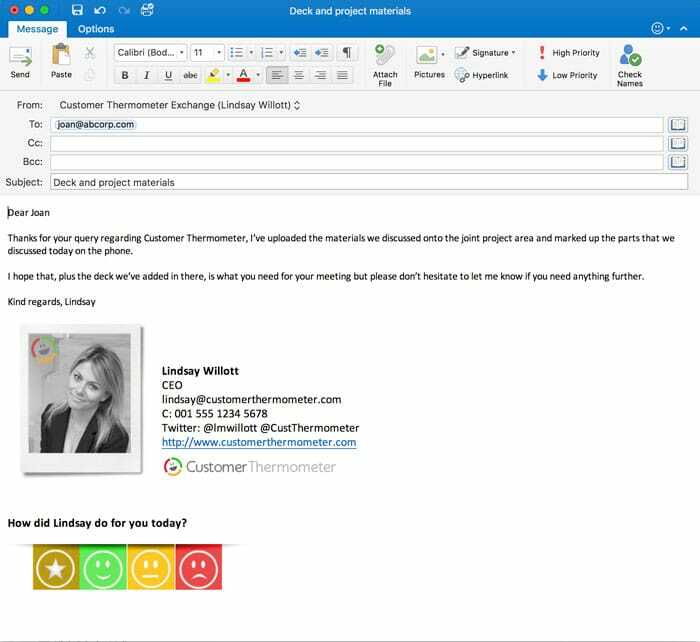 Simply add a Customer Thermometer survey to your Outlook email signature to give every recipient a chance to express their opinion on how you’re doing. We have a whole library of feedback icons, or you can even use your own icon set if you prefer. With one-click feedback, you’ll find your survey response rate going through the roof. Got a great product that you want to highlight, or a recent release you’d like to raise awareness of? It takes just a few minutes to create a hyperlinked button and banner and drop them into your email signature. This will help you to drive sales right from within each email you send. 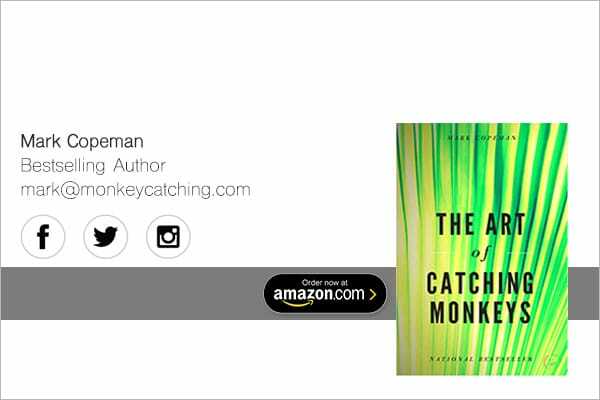 Check out this author’s banner, book image and handy link to Amazon’s listing of his book. If you regularly send emails to your customers or potential customers, remember that some of the coolest email signatures are engaging and salesy too! 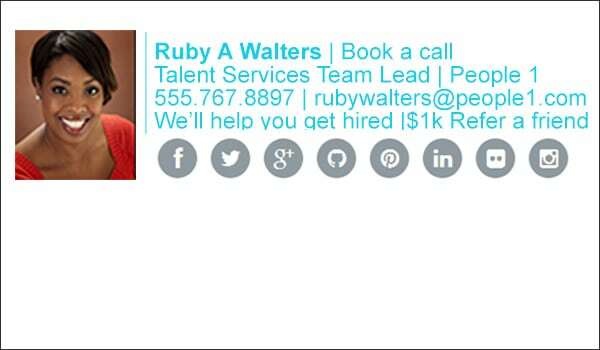 If your company is active on social media, be sure to include hyperlinked social media icons in your email signature. This helps your customers find new avenues to keep up to date on company activities and drives social engagement. 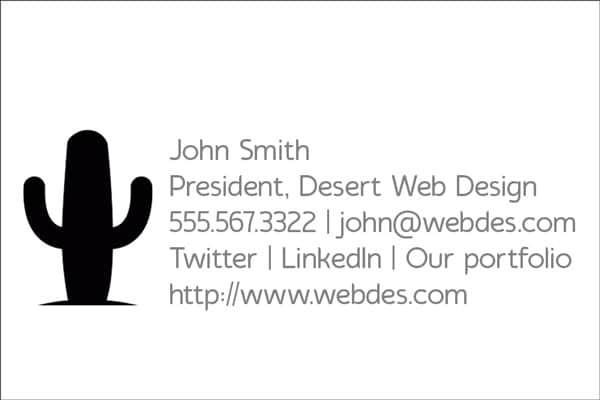 Here’s an inspiring and creative email signature example from a design company. 7. Promote your latest idea or event! Some of the best email signatures change regularly to reflect a company’s current promotion or activity. Your email signatures are a great opportunity to promote your company’s latest marketing campaigns, special offers and forthcoming events. 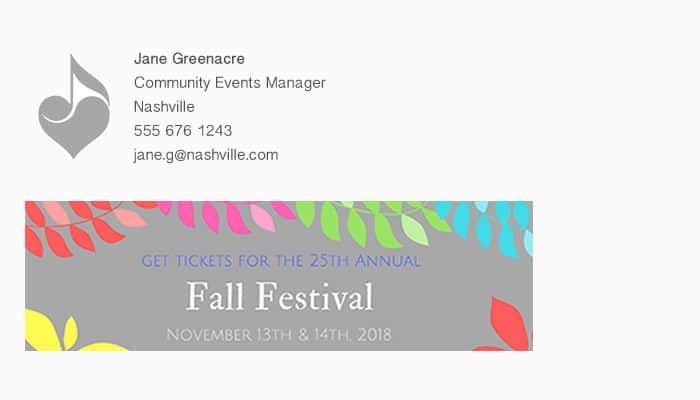 Here Jane Greenacre is using her email footer to promote the Fall Festival, and the banner links directly through to her ticketing site to drive sales. You can also add a campaign tracking tag, to identify click throughs via your Google Analytics reporting. You can see how to do that, here. 8. Use a photo of you! 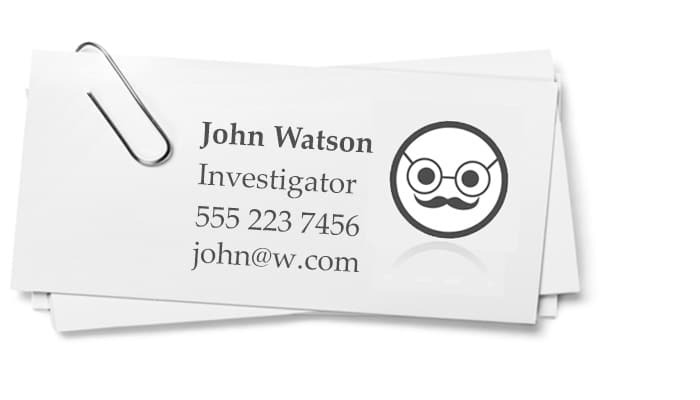 Using a (well taken) photo can help to personalize your email signature. It’s great for clients to be able to put a face to the person they are talking to, strengthening your client relationship. This is especially helpful when you or your team communicates remotely a lot and doesn’t get to meet people in person. 9. Polish up that trophy! 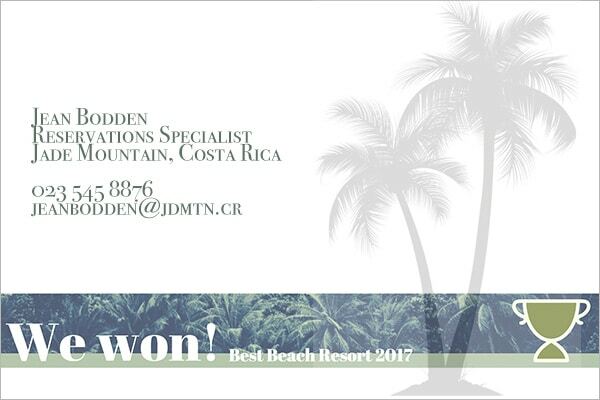 Here you can see an award for ‘Best Beach Resort’ featured in the email signature below. This is really useful to show that you are an established player within your industry and communicates respectability. 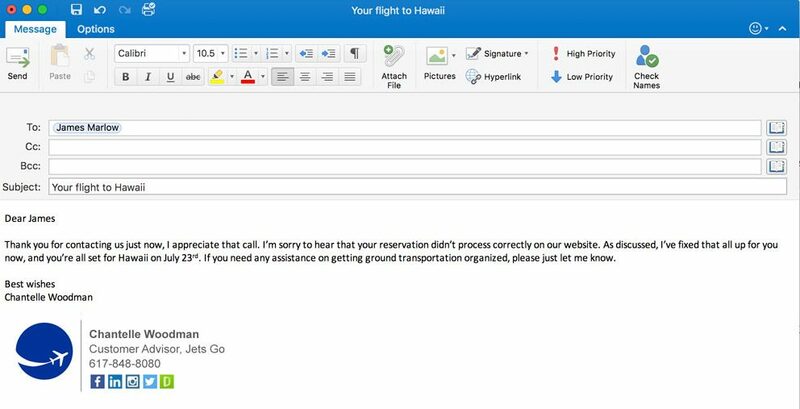 Anyone corresponding with this hotel about a potential booking will see the news about the award in their awesome email signature, even if they’ve missed it online. 41% of people open their emails on mobile phones instead of desktops. With that in mind, you’ll need to make sure that your signature looks just as good on a phone as a web browser. Keep any images small and to scale – aim for no more than 600 pixels. Big banners will be difficult to read on a smaller screen. Work in a team that delivers an internal service? 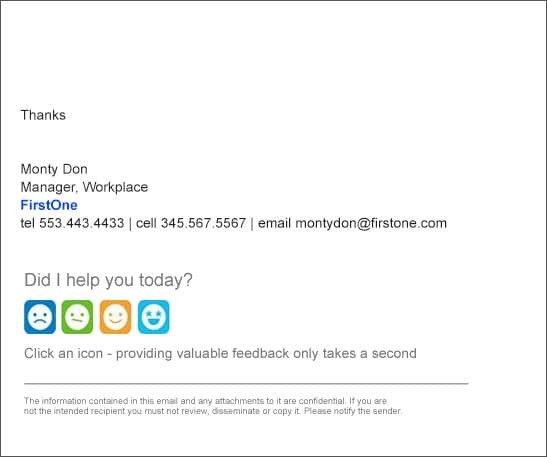 Use your email signatures as a feedback mechanism like this example below. You could also link to internal blogs or highlight a great team metric. Tracking an internal customer satisfaction KPI is easy if you’re using an internal email signature. Learn more about measuring internal satisfaction by clicking the link. It’s easy to put images into your email footer so you can get a reaction from your colleagues or customers about something. If you regularly send ideas, proofs, thoughts or proposals, and it fits your brand, this is a great way to get some engagement and add some fun right from within the email you’ve sent. To illustrate this, we’ve used to images from Buzzfeed’s reactions icon set, but you can create your own or get some from an online image source really cheaply. 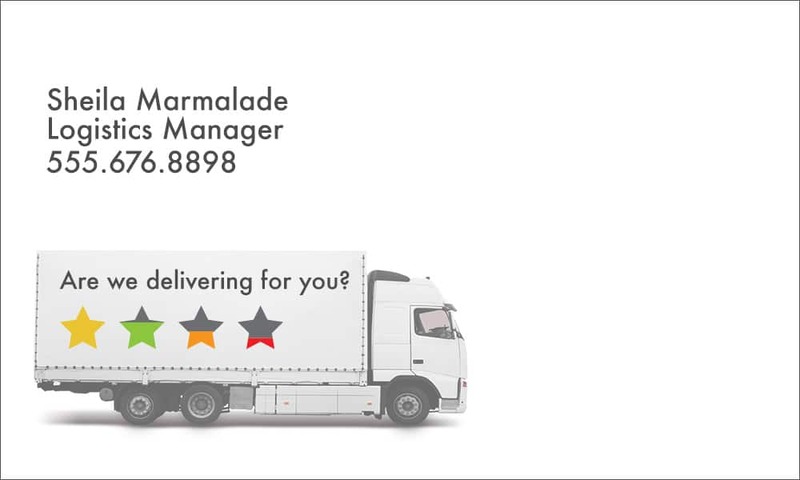 This trucking company have really focused on what they do in their email footer, by adding one of their trucks to their very cool email signatures. As well as highlighting what they do, they’ve turned it into a way to get customer feedback on their performance. The same space on the truck could be used for social media icons, URLs, event ads or any other promotional activity. This would be great for customer-facing service teams. If you’re wondering how each button is created with a unique link to click, you simply create a single image and cut it into four separate ones… Next, save them off and then add them to your signature, without any spaces between them, so it appears to be a single image. You can then attach Customer Thermometer tracking links to each image in turn. Ensure everyone across the company is using the same cool email signatures to maintain professionalism and avoid confusion. Set up every new employee with a professional email signature template, changing only personal contact details as part of their onboarding. Simple is often beautiful, as in this stylish example. Use a more complex and bolder signature in an initial email to make a professional first impression. Then use a shorter, simple email signature in replies. You don’t need to repeat all of the information with each email. This will keep your correspondence cleaner. These settings are easily found within the signatures area of both Outlook and Gmail. 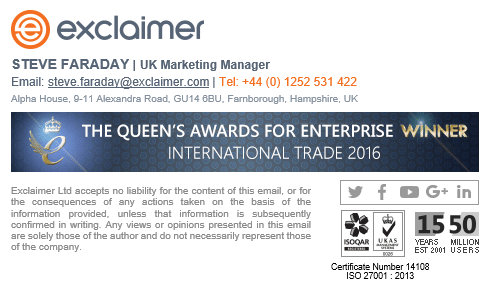 This clever email signature contains hyperlinks to Book a call with Ruby, and also links to the company’s Refer a Friend scheme as well as their social media properties. Always be selling – or, as we like to think here at Customer Thermometer, helping people to buy. 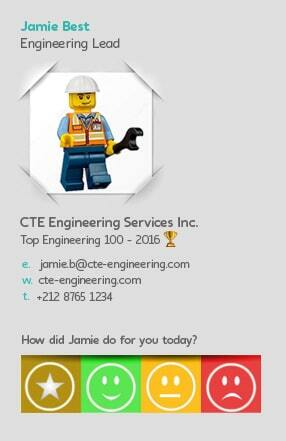 One of our partner companies highlights how much information can be contained in a single, creative email signature. All the standard information is here, as well as a banner about their latest award win, their social links, and their certifications. A very simple but eye-catching email signature here. 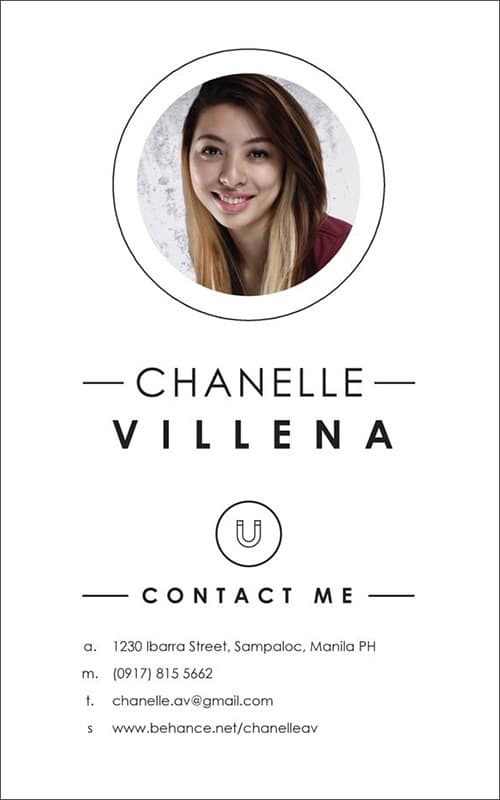 Chanelle’s layout and use of a circular photo brings interest whilst the minimal approach keeps the email signature very clean and clear. This great signature belongs to one of our design agencies and we love its use of color, the strong blue bar with the URL in, and the stamps at the end. It manages to contain a lot of information without being cluttered. This hotel has kept things clean and clear in its email footer, using just black on the white background. 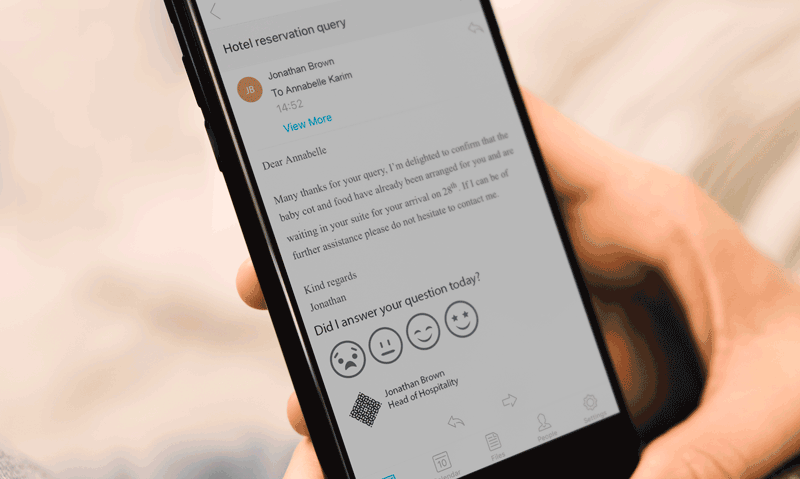 Used by the customer service team, the signature generates feedback without being intrusive, and the monochrome design is really eye catching. 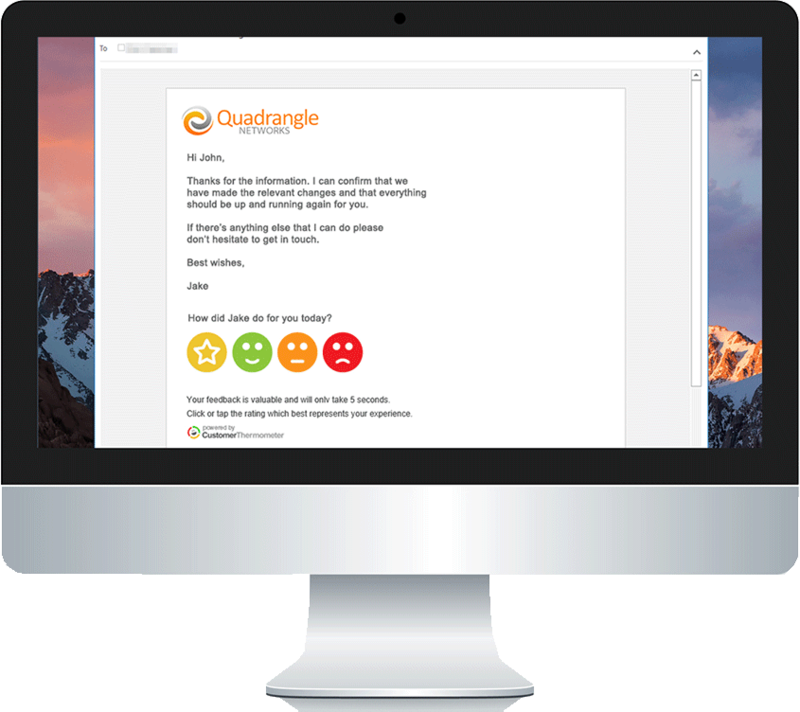 If you’d like to use your email signature for more than just your name and email address, try Customer Thermometer’s email signature feedback service.